quiltcrazy: It's Time Again for "Challenge Walk MS"
Kathi and I have been friends for over 35 years. She was diagnosed with Multiple Sclerosis in her early 30's. It has progressed to confinement to a wheelchair but her faith, sense of humor and spirit has never diminished. I made this colorful lap quilt for her last year and she loves that it draws people to come over and talk to her. My niece also has a long time friend, Rita, who has MS. As part of Team Momentum, Abby will walk with friends who have known Rita since High School. Abby raises additional money by raffling a quilt that she and I make. This was last year's and we will be starting another very soon. The T-shirts for the walkers and volunteers become the focus and create the theme. Tropical stamp fabric was perfect for the sashing and palm tree flannel became the backing. The hibiscus flower was scanned from the logo and enlarged. I used fusible web (see "Mon" entry) and machine applique to create this shadow effect. What a wonderful charity! My aunt had MS and it was very difficult to see it progress. But I know now that they have drugs that can slow down the progression of MS. 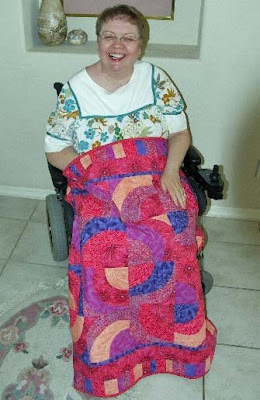 Your friend Kathi looks so happy with the lovely quilt that you made for her. 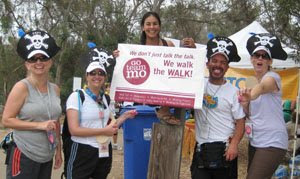 Good Luck with the walk, I hope you not only raise a lot of money, but awareness as well. Kathi looks very pleased with her quilt. It's so bright and happy.